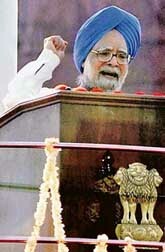 Prime Minister Manmohan Singh today made a rare departure from unwritten protocol. He mentioned Pakistan in his Independence Day address from the ramparts of the Red Fort and said the dialogue process could move forward in an atmosphere of peace. Is Sri Lanka unsafe for Indian cricketers? 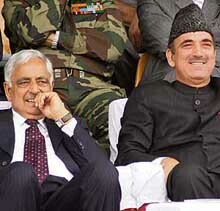 While the Independence Day celebrations across Kashmir valley passed off peacefully, the function at Bakshi Stadium, the venue of main celebrations here, had to be called off midway due to security reasons. In a desperate bid to salvage the tri-nation series, Sri Lanka today rescheduled the tournament to give more time for review of the security situation because of which South Africa has threatened to pull out. South African cricket team's media manager Gordon Templeton interacts with the Press in Colombo on Tuesday. It is not just nuclear cooperation. The US attempt is to coopt India into its imperialist machinations the world over. Parliament will have to discuss this issue. Ahead of the Rajya Sabha discussion on the Indo-US nuclear agreement, Prime Minister Manmohan Singh will hold a meeting tomorrow with scientists in the field, apparently to finalise the government’s response on the issue. Power situation worsened in Punjab today after power supply from other states got disrupted due to a fault in the Dadri-Rehand transmission system. In a major relief to the liquidated Punjab Government undertaking Punwire employees, the Supreme Court has rolled out a comprehensive plan for the payment of their dues by settling a dispute between two private companies — Winsome and Sungroup — over the purchase of assets of the public sector company. A poor monsoon means Punjab faces a drought-like situation that has not only jacked up the cost of paddy cultivation but also dealt a triple blow to the state.